Cyberpower reveals new gaming PCs with NVIDIA's GeForce GTX 670 graphics card. Cyberpower Inc. www.cyberpowerpc.com, a global manufacturer of custom gaming systems, today announced the integration of NVIDIA’s powerful new GeForce GTX 670 single GPU video card into its line of desktop gaming PCs. The GeForce GTX 670 graphics card taps the new GeForce Kepler architecture to deliver faster, smoother, richer gaming performance. The GeForce GTX 670 is clocked at 915 MHz and can be “GPU boosted” to a blazing 980 MHz and features 2GB of GDDR5 memory. The GTX 670 is multi-display friendly featuring 2 DVI ports, a HDMI port and displayport. CyberpowerPC customers can explore richer gaming environments, brought to life by the latest NVIDIA advancements such as Surround multi-monitor gaming from a single card, supercharged life-like details through PhysX technology, 3D Vision plus the extreme power of 3-way SLI technology. Starting today, CyberpowerPC customers can configure new GeForce GTX 670-based gaming systems. The card will be made available on all CyberpowerPC gaming PCs including the enthusiast Fang III series, Zeus series, Gamer Xtreme and Ultra series of custom gaming systems. The card will be a standard feature on the Fang III Cobra and Zeus Thunder 4000 systems. CyberpowerPC systems based on this evolutionary graphics card will start under $1300. No matter which options you choose, CyberpowerPC GTX 670-powered gaming systems deliver everything you need for great gaming. Additional standard features include NVIDIA GPU Boost, which maximizes clock speeds for the best performance; gaming innovations such as Adaptive Vertical Sync for faster frame rates and ultra-smooth gaming and NVIDIA TXAA (anti-aliasing technology) to minimize jaggies and screen-tears. All systems are housed in gaming chassis from top-tier manufacturers that are designed to provide ample features and intelligent functionality with emphasis on advanced cooling, silent performance and extreme airflow. Every system is meticulously built with precise cable routing to ensure optimal airflow and a clean aesthetic appearance. CyberpowerPC loads every system with Microsoft Windows 7 Home Premium operating system for an enhanced gaming and multimedia experience. 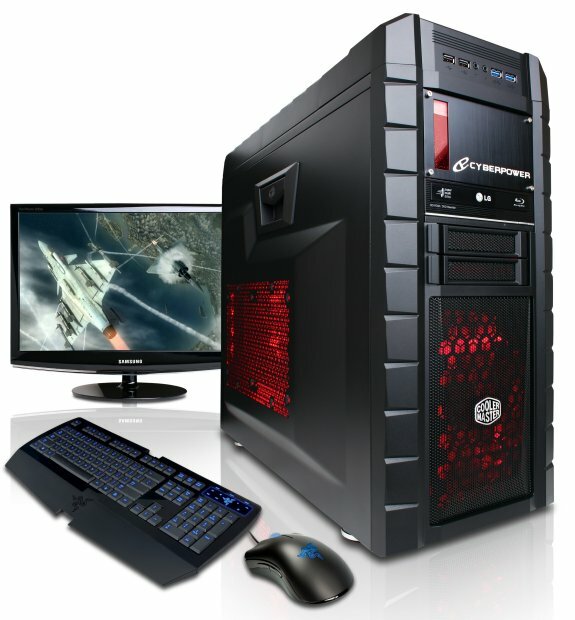 All CyberpowerPC desktop gaming systems include an industry-best-3-year limited warranty.